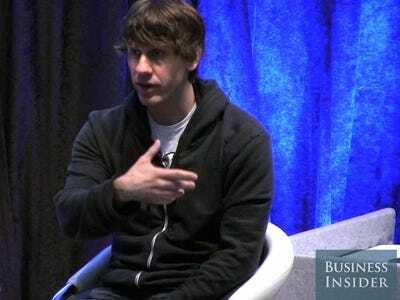 Foursquare cofounder Dennis Crowley isn’t afraid of big bad Facebook. At least, that’s what he’s telling us. Crowley’s Foursquare, the still-fledgling service that tells you where your friends are hanging out, is suddenly facing an existential threat from 400 million member social network Facebook. Facebook plans to clone Foursquare’s central service — the ability for site members to use their phones to “check-in” from restaurants and bars — and make it a mere Facebook feature. But Foursquare cofounder Dennis Crowley says there’s something Facebook can’t clone: the real-life friendships between Foursquare users. “Facebook used to be who your friends are, now it’s everyone,” Dennis told us in an interview. That’s right Facebook, Dennis Crowley says your social network is now a place where people will become “friends” with people they aren’t actually real-life friends with. On Foursquare, his argument goes, users are only “friends” with people they truly wouldn’t mind running into during a night out. Here’s the main problem with Dennis’s very sound argument: Facebook has 400 million monthly users. Even if “checking-in” with Facebook only catches on with a small percentage of the site’s users — such a userbase could easily dwarf Foursquare’s half a million users. If you’re rooting for Dennis and Foursquare — and who doesn’t pull for the underdog — the ultimate reason to believe in Foursquare is that its very existence depends on surving this battle. It has to win or it dies. Facebook, meanwhile, could give up on check-ins and still go onto a huge IPO in 2011. If the going gets rough in this competition, Facebook has no reason not to get out. Update: Dennis adds in the comments that there’s more to Foursquare than “it’s highly curated social graph.” He says the company is focused on offering the best “elements of gaming, recommendation services, special offers from local merchants, etc.” And that’s its killer feature. Er, I think this is taken a little of of context. Jay and I were talking about the how the social graph looks different across different services (e.g. how Twitter is a good mix of friends & public figures / celebrities for some) and how the social graph of services evolves over time (e.g. how many of us said that with Facebook we’re *only* going to add our real life friends.. before we all started getting friend requests from our mum & Dad and friends parents). This post seems to imply that foursquare thinks it’s greatest asset is it’s highly curated social graph. I don’t think this is the case at all (esp as it’s something both Facebook and Twitter could replicate with great “lists / groups” features). As check-ins start to become a commodity – a feature offered by Twitter, Facebook, Google, Yelp – the advantage will go to whoever can make a checkin more interesting / fun/ relevant. This will require combining elements of gaming, recommendation services, special offers from local merchants, etc. It’s all about the *reason and motivation and incentive* behind checking-in. This is what we’re focused on – and what we feel we can do better than any other player in the space.